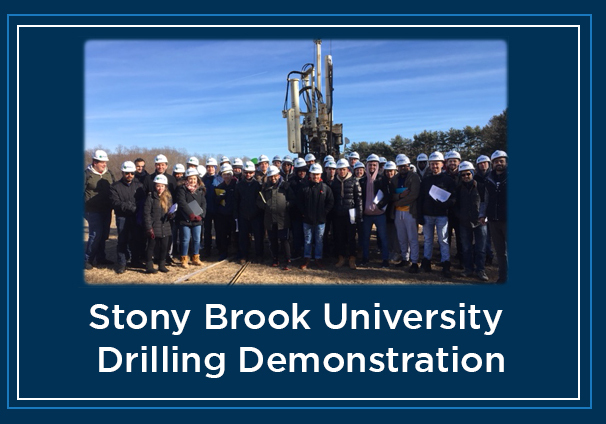 Drilling Demonstration for Stony Brook University Civil Engineering Department - P.W. Grosser Consulting, Inc.
P.W. Grosser Consulting, Inc. (PWGC) Executive Chairman Paul W. Grosser, PhD, PE, PG, led a drilling demonstration for students in Stony Brook University’s (SBU) Civil Engineering Department on Feb. 19, 2019. The event allowed the students to garner valuable hands-on experience as they work towards their engineering degrees. Dr. Grosser, a member SBU’s Civil Engineering Advisory Board, believes there is a need for real world experience in addition to classroom lectures to achieve the best educational experience for engineering students. At the drilling event, he discussed the civil engineering industry with the students before the demonstration and answered student questions following the drilling exhibition. 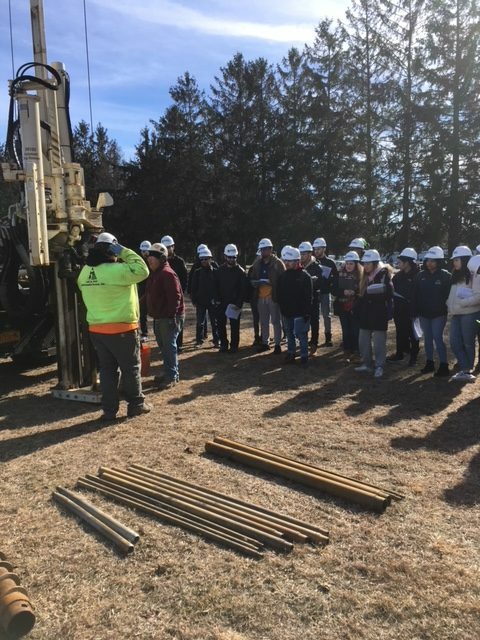 The drilling demonstration was conducted by Center Moriches-based Land, Air, Water Environmental Services, Inc. (LAWES), whose representatives provided details about the drilling process, referring to details such as blow counts, and provided the students with advice regarding drill operation. Overall, the event was a great experience for all parties involved. Sherif Abdelaziz, Assistant Professor with Stony Brook’s Civil Engineering Department, indicated he has received positive feedback from the students. “We cannot express how thankful we are for the great experience you provide to our students year after year,” stated Sherif. “We value your support from all perspectives. It adds another experience to our students that they won’t have at any other learning institution.” He indicated that his students react positively to the field drilling event each year, which helps to communicate engineering theories and methods and gives students real-world experience regarding how they will apply the theories they are learning as their careers evolve. We appreciate the kind words and are proud to provide a hands-on experience that allows the students to use their knowledge in a practical environment. We are looking forward to next year’s drilling demonstration!